Tough Technology Products Ltd develop and supply leading repair and maintenance products to workshops and repair centres in the UK. One of the products - Cobalt Drill Bits proved to be a 'hit' within the commercial repair and heavy plant workshop. 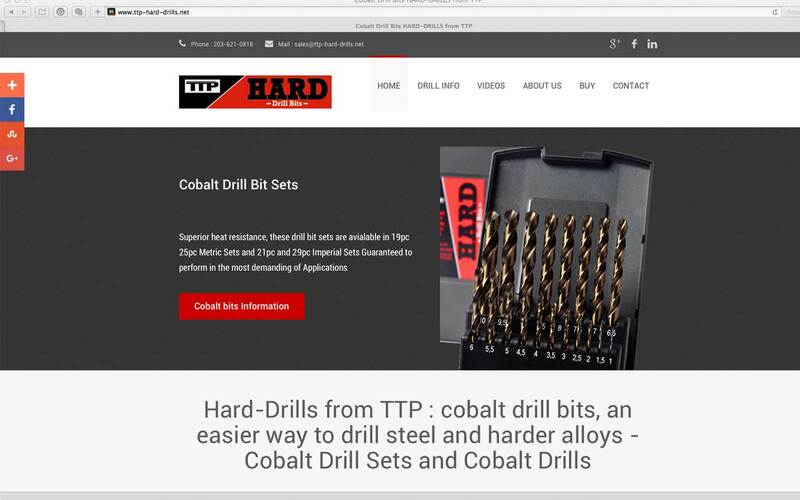 A small website focusing on information on their cobalt drill ranges was constructed. ' Content' is king as the Google manter goes it was quickly realised from high levels of traffic that a simple ecommerce shopping cart was needed. After proving successful in the UK a similar site was deveolped to target the USA. Targeting the USA needs a different approach - the USA site (www.ttp-hard-drills.net) version although basicaly a copy of the UK version needs a range of coding, hosting and SEO work to be implemented and undertaken to ensure exposure. On completion a diverse range of social media and search engine optomisation was undertaken. Google 1st page result for cobalt drill bits and generic related target key phases.